Among the first people that I met at the church was brother Chuck Campbell. He and Reverend Sue were warm, welcoming and easy to connect with. I immediately felt I was among trusted friends in their company. During our trip to Albuquerque in January, Tamara and I connected with Chuck for what would be our last time. We connected deeply over our love for Unitarian Universalism and jazz. Chuck died and I’ll really miss him. Our deepest condolences go out to Reverend Sue and her extended family. Deep connections are what people seek most in religious community. One of my dreams is for everyone who comes through the church doors to experience that with someone they meet. If each of us strives for true meaningful connection, especially with newcomers and visitors, I bet we’ll become known as one of Las Cruces’ most beloved churches! Wholeness is our April ministry theme. What a wonderful way to begin the Spring. All spiritual paths lead to wholeness of mind, body and spirit. One way that we examine wholeness is through Easter and Holy Week. This year, we’ll hold special services that commemorate our Judeo-Christian origins. These include Palm Sunday, Maundy Thursday and Easter. Then, we’ll share a Seder meal following the 2nd service on April 28. Everyone is invited to all services. Bring your friends and family. I hope that you are attending to your spirit. Listen closely. Respond with curiosity and often. Be whole. There is a variety of articles the congregation may find interesting in this section of our website’s home page. About a quarter of American adults say they haven’t read a book in whole or in part in the past year. Who are these non-book readers? Read the article. The purpose of this column is to keep you informed about recent Board of Trustee actions. Complete minutes of all Board meetings may be viewed in the office; please contact the Congregational Administrator. The board meets on the third Wednesday of the month. Robert Floyd was accepted as the newest member of the Board of Trustees; he will fill out Laurel Irwin’s term. Jan Thompson and Elisa Sanchez will be certified as delegates to the Unitarian Universalist Association General Assembly in Spokane, WA in June of this year. Nachison departure – People are asking why the Nachisons resigned their membership in the church. Unfortunately, Jerry disagreed with our perspective on programming. We hold them in our hearts. If you ever consider leaving the church, I hope you first will make an appointment to visit with me. Let’s resolve differences and remain in covenant with one another. Auction – A big shout-out to all persons contributed services and events to our annual auction. Be sure to place your bid for Tamara’s and my auction items. Show love for the church! Bid high! Social Justice community-wide project – Wait for it, wait for it…it’s coming soon. Be on the lookout for an announcement from the Social Justice Committee. We’re looking for full church participation! Religious Education Building – We are working feverishly to clean up the odor in the Religious Education Building that seems to be a result of the new roofing. If you discover a blower running, it is for reducing the odor. There is no health risk by being in the building. Lobby water – Although the water has an odor, it has been tested and found healthful. The odor results from lack of use of water taps. We need more activities in the building to relieve this problem! Remember! Love in all you do! Education never ends. Come join our discussions. Our goal is to learn more about all sides of issues and more about each other. If you have a comment or suggestion, email it to roundtable@uuchurchlc.org. The challenges ahead threaten to overwhelm. What an honor to be engaged in the GREAT WORK of fostering a mutually enhancing human-Earth relationship! Supporting one another through the stages of grief and inevitable challenges along the way is surely medicine for our collective soul. Senator Soules was asked to participate in a discussion on the accomplishments of the current Legislative session and what he thinks still needs to be done in the future for New Mexico. The Social Justice Committee meets monthly on the second Wednesday at 1:30 in the library. Everyone is welcome to attend. This thank you recently arrived at the church from the Border Service Corps (BSC). Thank you so much for your donations collected for Undies Sunday! We also appreciate your continued support with meals, requests for peanut butter/jelly sandwiches, etc. THANKS! If you want to help prepare and serve these meals, you can find sign-up sheets in the Religious Education Building Great Room at coffee time on Sundays, or contact Susan Bagby. The Border Service Corps (BSC) now serves as site manager for regular “weekend hotels,” providing hospitality in local motels for groups of 50-70 refugees. (The size of these groups is expected to grow significantly in coming months.) All the services provided during the week by BSC at Peace Lutheran and other hospitality centers must also be provided on this larger scale every Saturday and Sunday: clothing, food, wellness checks, travel arrangements, travel supplies, and transportation. Volunteer organizations are stepping up to help. So, in addition to the weekday meals we provide at Peace Lutheran, Our church will provide refugees with a sack lunch on the first Saturday in April, May, and June. The cost of these lunches has been almost entirely covered by several generous donations. Our first sack lunch will be Saturday, April 6. If you want to help assemble the sack lunches, you can find sign-up sheets in the Religious Education Building Great Room at coffee time on Sundays, or contact Susan Bagby. Church members and attendees: Go to your InFellowship account and chose “Your Giving” then in the “Give to” block select Hospitality for Refugees. If you don’t have an InFellowship account you can go here and in the “Give to” block select Hospitality for Refugees. For other options and more information, please see Susan Bagby. I would like to invite you to join us at First Unitarian in Albuquerque (UUABQ) for two workshops with Matt Meyer, a talented musician, song-leader, social justice activist, and community organizer from Boston, MA. Matt is a co-founder and director of Sanctuary Boston. He has led music at Unitarian Universalist Association General Assembly and many regional events. Matt will be at First Unitarian May 17-18. On Friday evening, May 17, he will lead a 90 minute workshop on mobilizing congregations for social justice work. Attendance is free for active members of UUABQ Social Justice Council. The 3-hour Saturday morning workshop is for worship leaders, worship teams, religious educators, and musicians. The workshops are free for members of UUABQ and our branch congregations: worship leaders/coordinators, RE curriculum planners/teachers, choirs, band, Family Sing song-leaders. Folks from other churches are asked to pay a moderate admission fee, as shown on the flyer. Child care will be provided, but please let us know in advance if you need it. Matt will be leading worship at Unitarian Universalist Church of Santa Fe on Sunday, May 19, and leading a workshop there Sunday afternoon, “Drumming With Spirit”. Here is a flyer for this event. To reserve a spot or get more information, please contact me by email or phone, Susan Peck speck@uuabq.org 541-207-2889 (cell). Would You Like to be Part of a Covenant Group? Covenant groups are groups of six to eight Unitarian Universalists and Friends who meet regularly for six months to a year to share and support each other on their spiritual journeys. A way to maintain a “small church” feeling of fellowship within the larger church. A place that provides a personal touch to keep us feeling connected to UUCLC. A place to explore and ponder some deeper issues of life. A place where we can have meaningful connections with other UU’s. Begins with a brief check in allowing us to catch up with each others’ lives and get to know one another on a deeper level. Continues with shared reflection on a theme, possibly related to recent Sunday sermon topics, often topics with which we struggle but have few places to explore and share our thoughts, feelings and questions. This strengthens our ties to each other and offers expanding opportunities for growth, caring and connection within the congregation. The Tombaugh Gallery is calling for regional artists within a 200 mile radius of Las Cruces to submit proposals for exhibitions for the 2020 calendar year. Non-traditional media or subject matter is welcome. All artwork must be for sale. Submissions should contain a proposal with information about the artist, type of work to be shown and USB flash drive containing eight (8) representative images as JPG files. For group shows, supply a list of all members and 1 or 2 images from each member. If a show theme is being considered, please explain the theme fully. The Tombaugh Gallery has 44 linear feet for wall display, and in addition, has several pedestals. Submissions should be postmarked no later than April 15, 2019. Submissions will be reviewed, and applicants will be notified by May 15, at which time possible show dates will be discussed. Artists/shows not selected will be notified at the same time. Artists who want their media returned, must send a SASE. Artists who prefer to send an electronic submission may contact Judy Licht at gallery@uuchurchlc.org for instructions. April Dining Out is at 5:00 pm on Friday, April 19, at Lorenzo’s, 1753 E University Ave. Please sign up by Wednesday (17th). For information contact DiningOut@uuchurchlc.org. The Annual Auction is April 27, 2019, at 5:00 PM and the theme is “A Night at the Ranch”. PLEASE LET THE AUCTION COMMITTEE KNOW IF YOU INTEND TO BRING CHILDREN TO THE AUCTION. We need to know as soon as possible so we can arrange childcare for them. Auction raffle tickets and gate tickets are now available online at http://www.uuchurchlc.org/member-utilities/. It’s been a long time since we’ve had a church picture directory so we are working with Lifetouch to develop a new one. We hope you’ll participate by having your picture taken. We urge all individuals and families to join in this project. Here is a very short video that explains why we think it’s important to have a new church directory. We’ll have a lot more information for you soon but if you’re ready to schedule your pictures, just click on the picture below. Pictures will be taken on May 10, 11, and 13. In order to raise interest and to help your congregations learn more about General Assembly, we have assembled promotional resources to download, copy, or print for further distribution. Rev. Dr. Todd F. Eklof welcomes Unitarian Universalists to Spokane, location of the 2019 General Assembly (GA) on behalf of the Unitarian Universalist Church of Spokane. I’m not a big believer in New Years Resolutions. I figure, if you want to do something to change the direction of your life, you could do that at anytime. But I am very much aware of the changes that may occur in a life’s journey and the possibilities that those changes can bring. We sometimes call this turning over a new leaf, a reference to a 16th Century idea of turning a page in a diary or journal with the new sheet before you, blank and full of possibilities. The demolition of the Rental Property is underway. The tenants are all gone. The water and electricity is shut off. Our crew has stripped and boarded up the building. We’ve hired a contractor to do the demolition. And we’re waiting on the lab results of the (possible) asbestos contamination. Soon we will have an unobstructed view of the North wall that separates our property from that of our neighbors. Clearing this land is like turning over a new leaf. This is our blank page. We will have the possibility of opening up the area to new development, and we will also have the possibility of getting to know our neighbors. Because as part of the demolition process, we intend to inform the neighborhood that the building is coming down. This gives us a great opportunity to spread the word about Unitarian Universalism and to remind our neighbors about the Church that lies right in their backyard. I invite you to go with me when we knock on their doors to share this good news with them. In early March, those of us who sing with the local shape note singing group helped to host the annual Elder Gerald Hand Memorial shape note singing convention—one day in our Religious Education Building great room, and one day at the WIA building in Pioneer Women’s Park. We hosted singers from Washington State, New Hampshire, Colorado, California, Arizona, and Texas, and sang about 80 hymns in two days. This is another tradition that is very fulfilling to me to participate in, allowing me to reconnect with friends I only see every year or two, and bringing together people from all walks of life. I was chaplain this year, meaning that in this democratic tradition I was elected to deliver the prayers for opening, closing, and grace before meals. This role helped me appreciate the responsibilities of our minister! We have produced two concerts recently. 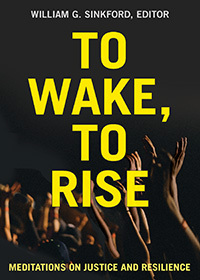 Political satirist Roy Zimmerman has a new album called Rise Up. Lisa Lynne and Aryeh Frankfurter perform Celtic music on a variety of fascinating instruments in addition to telling stories. These musicians have, individually and collectively, sold millions of CDs, and I would have liked to have had a larger audience for them. Lisa invited those interested to put their hands on the strings of her Celtic harp afterwards. I did so, and it gave me a thrill, and a glimmer of something I would like to do in the near future. I am looking forward to continuing to offer special services during Holy Week—specifically on Maundy Thursday and Good Friday (4/18 and 19). These quiet, more reflective services give us the opportunity to focus on some of the big issues in life—life, death, suffering—before the Easter celebration of the miracle of living. I’m glad that Rev. Xolani is willing to do them, and music will of course play an important role. It is very easy to make a gift to the church through InFellowship. Donations in memory of members and friends become part of our Endowment Fund. These are gifts that keep on giving. The Tombaugh Gallery presents the work of photographers Victor Gibbs and Bob Peticolas, in the exhibit “Into the Night” from March 3rd through April 13th. Both photographers are featuring night images of the Southwest. Gallery hours are Wednesday through Saturday, 10 – 2. For details, contact Gallery@uuchurchlc.org, or call the church at 522-7281. The Tombaugh Gallery is located inside the Unitarian Universalist Church, 2000 South Solano Drive, Las Cruces, NM and is open Wednesday – Saturday 10 am – 2 pm. Visit the gallery on Facebook. Unless otherwise stated, all events will be held at the church. Please check the church’s online calendar to ensure the most recent times and places for these events. Newcomers are invited to participate in these activities. Bridge Group plays bridge on the first, third and fifth Thursdays at 1:00 pm in the church lobby. If you want to play, be sure to contact Nancy Anderson bridge@uuchurchlc.org a few days before so we know the number of players. Desert Spirit CUUPs is a Las Cruces chapter of the Covenant of Unitarian Universalist Pagans. We practice and educate others on Earth-centered spirituality. We gather monthly on the 3rd Saturday of each month at 6 pm for a potluck and either ritual or an informative class. All events are open to everyone interested in learning and/or growing in their spiritual path. Events held at the church unless otherwise noted. Visit http://www.facebook.com/desertspiritcuups or email lascrucescuups@gmail.com. Dining Out: A different restaurant every month and dinner with church members. Signup sheets are in the church lobby on the welcome counter. You should sign up not later than the Wednesday prior to the dinner. Look in the church newsletter “The Light” for the exact time, date and location or contact DiningOut@uuchurchlc.org for more information or to reserve a place for the dinner. Lunch Bunch is a weekly lunch-time get together. Everyone is invited to bring a lunch to the church library every Wednesday at 12:00 noon and enjoy the company of fellow Unitarian Universalists. Quilting Bee: The UU Bee Welcome, meets every week in the church lobby. The Bee is open to all levels of quilters, both members and non-members. It welcomes all styles of quilting work from machine-quilting to hand-quilting to appliqué. The purpose of a quilting bee is to provide an opportunity for quilters to spend time together as they work on their individual quilting projects and exchange tips of the trade, encourage and support each other, share new ideas, deepen friendships, and generally have a good time. A $1 donation per quilter will be given at each session to cover the cost of utilities. The contact person is Chris Ramsey. Unitarian Universalist Children’s Playgroups (all are welcome): Parents/caregivers must remain on site with their children. The members of the group plan outings, holiday celebrations and other activities together. Contact Susan Freudenthal, DRE, for more information. Monthly Calendar: To get the information you need about the many and varied activities of our church, go to http://www.uuchurchlc.org/ and scroll down the page to the calendar and events listings. Look for the latest version of The Light on the 1st of the month. The deadline for articles is the 25th of the month. Send articles to thelight@uuchurchlc.org. Articles should be as short as possible but not longer than 450 words. Click on any of the little printer icons to print a clean copy of The Light.